It’s almost our 500 year anniversary! Spain had a thorough and meaningful influence on city planning on early America, although the legacy is not widely known. This legacy was a governing code of city development called the Laws of the Indies, issued formally in 1573. OK, so we’ve got a few years until that official issuance anniversary. But since the Committee on Design is visiting Seville this week, it’s a good time to visit the General Archives of the Indies and consider the influence of Spanish thought on the development of New World colonies. 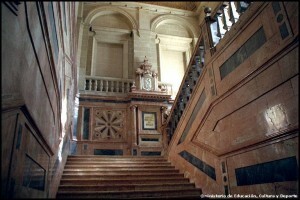 Seville’s General Archive of the Indies maintains and collects documentation about those Spanish colonial campaigns. Here, the Indies are the Spanish colonies in America; there is also a collection about the Philippines. This grand building was originally designed by architect Juan de Herrara and built between 1583-1646 to consolidate and house the various marketeers and businessmen for the colonies. Later, the efforts were moved to other cities around Spain. King Charles III in 1785 returned the headquarters to Seville and set about restoring the original building which sits today in the heart of Seville and next to the Seville Cathedral. It’s also near the bull fighting ring. This city’s got God, bulls, and business. Because of the relative inflexibility of Spanish colonial policy the regulations of 1573 remained virtually unchanged throughout the entire period of Spanish rule in the Western Hemisphere. Even beyond that time they influenced the plans of towns laid out in North America by the Mexican government after its separation from Spain. Literally hundreds of communities in the Western Hemisphere were planned in conformity to these laws – a phenomenon unique in modern history. So, what are some of the highlights of the Laws? 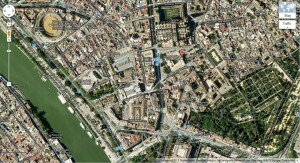 Would we know a town laid out according to Enlightenment-era Spanish city planning principles if we were in one? Think of St. Augustine, Florida. The town would be developed without natives present, so as to ‘wow’ the natives when they were allowed to enter. The regulations were specific and practical, designed to plan inspiring and functional towns in the new land. These developments were also designed for defense, so that colonies could withstand invading armies and peoples (Reps, p. 29). “If not started with form, they will never attain it.” was the written message to one colonizer (p. 28). And further, all the planning was to be done “…so that when the Indians see them, they will be filled with wonder, and will realize that the Spanish are settling there permanently and not temporarily” (p. 30). Reps, John W. The Making of Urban America. a History of City Planning in the United States. Princeton, NJ: Princeton University Press, 1992. I’m thrilled to be traveling to Seville, Spain next week and blog about the experience for the American Institute of Architects. The AIA, through the Committe on Design, hosts a few conferences a year in cities with a robust architectural history. The fall conference features a mix of historical and modern buildings and sites, including the Old City in Seville, the Madinat al Zahra, The Grand Mosque, El Alhambra and, on a modern bent, the Metropol Parasol, Casa de Retiro Espiritual and the site of the 1992 World’s Fair. And the conference covers this wide-ranging assortment of historic designs under the title The Role of Style in Defining Architectural Design Excellence. The shape of those parasols, the detailing and the expressiveness of the structure, facades and how they all fit into their contexts is what I’ll explore in this blog during the conference. I’ve got some ideas. I’m interested in hearing any of yours, too. 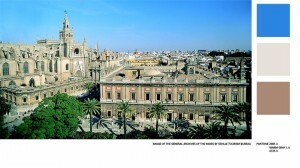 What have you seen in Seville? What has moved you? What seemed like a big deal, a gracious act? What treated the street nicely? “…attracted no less a mixture of people than New York or Philadelphia – English dissenters, French Calvinists, Scotch Convenanters, Barbadians, Dutchmen from Holland and New York, New England Baptists, Quakers, Irish Catholics and Jews – among others.” (G E Kidder Smith, A Pictorial History of Architecture in America, American Heritage Publishing Co, Inc, New York, 1981, p. 278). Anyone who’s visited during July, August or September would question the benevolence of the climate here – the humidity can ruin your day. But most of the year, it’s an incredibly generative place, for me, and one in which landscape and climate is as powerful a force as any machine. In this, I think the similarities between Seville, Spain and Charleston, South Carolina, USA, are worth exploring. As I write this today, the high temperature in Charleston: 64 degrees. Seville: 63. Hmm. I’ve put together a chart which captures some of my thoughts as I get ready for the conference. 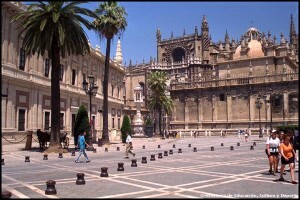 America’s major cities have some things in common with Seville. Primarily, the similiarity is an historically important port and a river (Los Angeles maybe less strongly connected to its river than other cities). That’s a good starting point for thinking about why cities are founded, and how they grow over time. Taking a lesson from Jane Jacobs, the mix of old, new, expensive, flimsy and all other sorts of conditions is what makes a city feel grown, and what makes living there inspiring, comfortable and mostly importantly, worthwhile. Year of Incorporation 1653 CE 1837 CE 1850 CE 1670 CE 188 BCE? I recently attended a US Green Building Council Charlotte Region Chapter event on LEED AP credentialing and maintenance, as part of the process of ‘converting’ my general LEED AP credential to the more up-to-date designation of LEED AP With Specialty. As a Specialty, I’ve chosen BD+C, which is the USGBC’s acronym for Building Design + Construction. This is the rating system which is roughly equivalent to the New Construction rating system test that I originally took to become accredited. Why would a LEED AP do this? As someone who tested under the LEED 2.2 rating system, I can opt (Option 1) to remain a LEED AP under all successive versions of LEED (we’re in LEED 3.0/2009 now) in perpetuity. And the LEED AP BD+C requires 30 hours of continuing education over 2 years to ‘convert’ (Option 2). With continuing education guidelines which are more stringent and also different than the AIA’s CEUs, I am looking at a lot of continuing education. And for what? Well, the benefits aren’t entirely clear right now – there’s no threat the general LEED AP designation will expire in the foreseeable future. But, I believe in trying to quantify the effects of good, green design choices, and it’s worth it to me to stick with LEED, and stay up-to-date. I’m also looking at the conversion process as a bonus for research that I would already be doing – might as well get the credential! There is a third option for ‘converting’ to a specialty AP designation, and that option is retesting (Option 3). I’m more interested in the continuing education rather the testing, so the continuing ed makes more sense for me, right now. As usual, in design and sustainability, there are choices and trade-offs to be made, and no ‘wrong’ answer. I’ll keep you posted on how the Credentialing Maintenance Program (CMP) is going – that’s the documentation of my continuing education hours. The USGBC announced recently that it will bring back Credit Interpretation Reports for public use. Long a valuable tool for LEED project teams everywhere, the public, precedent-setting CIRs disappeared with the coming of LEED 2009. And the USGBC says there may be a format improvement, too. Whereas the old CIR database was confusing to use, search and refer to, the new CIRs may be issued on one single, comprehensive, easy-to-search document. This could mean big savings in time, money and emotional distress for project teams and LEED administrators.